Text (tweet-sized to article length), logos & web graphics: optimized for the web and your social media needs. For higher resolution graphics/logos contact us directly. Recipe ‘cards’, optimized for Instagram and Facebook, text snippets/hashtag suggestions & e-books with recipes featuring Blue Lotus Chai. 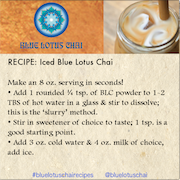 Blue Lotus Chai Sell Sheet Click to download this two page PDF. For wholesale pricing information, click here.